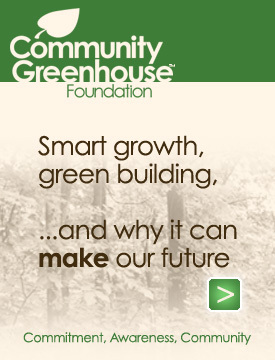 The Community Greenhouse Foundation, a 501(c) 3 not for profit organization, has partnered with Riverside Commons, LLC producing an “Educational Demonstration Program” that will raise awareness and promote the utilization of Smart Growth principles for the State of Florida. Riverside Commons, has agreed to let the Community Greenhouse Foundation utilize their project for the “Educational Demonstration Program” due to their belief and support in Sustainable Development. The Foundation will utilize the project for a 24 month case study, “Cost Benefits Utilizing Sustainable Development Principles for the State of Florida” that includes several comprehensive workshops and forums, allowing access to the public throughout the entire process. The goal of the project and case study is to promote sustainable development, to show exactly how a development project is conceived, designed and built, so that others can understand the process, and accelerate adoption of best practices and principles that ensure a more responsibly built environment for the future of the State of Florida. Riverside Commons is a commercial development of that will consist of 33,600 sq ft of office space among two buildings. The Riverside Commons development will be the first certified Green buildings that will demonstrate the technologies and products that promote the values of sustainable development for Brevard County and the state of Florida. The site development and buildings will meet the United States Green Building Council’s LEED™ (Leadership in Energy & Environmental Design) criteria and LEED Certification status along with the Florida Green Building Coalition (FGBC) commercial standards. The five-Acre project site has over 1.3 acres of wetlands and through the sustainable design goals of the project; the wetlands will become one of the main features of the finished site. The Case Study and Workshop series is being funded through Public and Private sector support. Organizations interested in supporting or sponsoring the “Educational Demonstration Program” please contact us.